Flat roofs are one of the most common roof types, and should be handled with special care to ensure their longevity is preserved. If you are experiencing leaks, cracks, ponding water or another problem with your residential or commercial flat roof, call us today. One of the roofers on our team will be able to handle it quickly, professionally and affordably. Though they are useful in a number of ways, low-sloped roofs (aka “flat roofs”) are prone to certain difficulties, which our roofing contractors are skilled at handling. 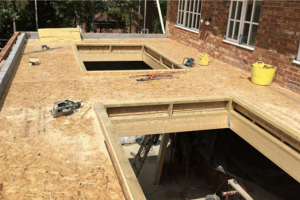 We offer a number of solutions to handling repairs, installation or replacement of flat roofs. We offer free estimates on all jobs we do, so schedule an appointment today! Commercial flat roofs are unlike any other type of roof, and we understand that. We have a number of different roofing materials that can be used on low-sloped roofs that will help your roof last longer, up to 25 years or more in some cases. Whether you’re looking for help to handle a particular problem area with your structure with repairs, or replace it entirely, our roofers are the team for the job. We pride ourselves in our skills and our professionalism, and we guarantee we will get the job done the best that it can be done. We also offer competitive rates and excellent customer service that can’t be beat. You won’t find a better deal with any other company around! Call us today to get a free estimate on commercial flat roofs, be it for repair, installation or replacement. EPDM/Rubber roofs – one of the most weatherproof and durable types of roofing systems, it has the longest-lasting membrane of any material used in the industry. Durolast – extremely durable due to its rubber membranes, yet combined with the unparalleled seaming process of PVC, so you get the best of both in one membrane. Modified bitumen – an asphalt roofing system that is proven to withstand a lot of traffic and standard abuse. 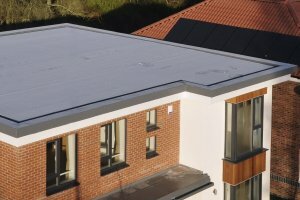 Built up roof – the traditional type of commercial flat roofing in America, which has recently seen significant upgrades in materials, design and application techniques. Give us a call to find out what it would take to have our top-notch team working on your commercial flat roof and turning it around. We can take a leaky, problematic industrial roof and turn it into a long-lasting, weatherproof safeguard for your property. Don’t miss out on the best service in the area. We pride ourselves in doing the job right, you can trust us to handle your needs with commercial flat roofs, we won’t let you down! We have the experience you want and the skills your roofing system needs. Don’t trust your industrial roofing to someone who only dabbles in it. We are true professionals at what we do. We are happy to repair, replace and install commercial flat roofs in Bentonville, Springdale, Fayetteville and nearby areas.